Flow cytometric analysis of HeLa cells using Tri-Methyl-Histone H3 (Lys9) (D4W1U) Rabbit mAb (PE Conjugate) (blue) compared to concentration-matched Rabbit (DA1E) mAb IgG XP® Isotype Control (PE Conjugate) #5742 (red). 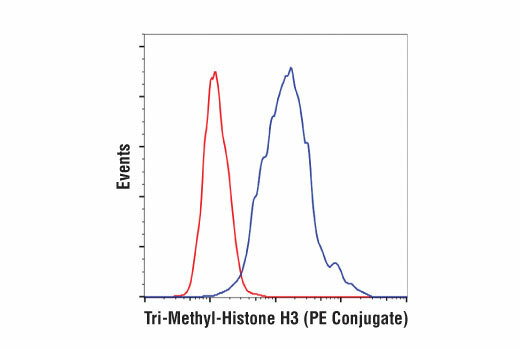 Tri-Methyl-Histone H3 (Lys9) (D4W1U) Rabbit mAb (PE Conjugate) detects endogenous levels of histone H3 when tri-methylated on Lys9. This antibody shows some cross-reactivity with histone H3 that is di-methylated on Lys9, but does not cross-react with non-methylated or mono-methylated histone H3 Lys9. This antibody does not detect tri-methyl histone H3 Lys9 when the adjacent Ser10 residue is phosphorylated during mitosis. In addition, this antibody does not cross-react with methylated histone H3 Lys4, Lys27, Lys36, or Lys79. Monoclonal antibody is produced by immunizing animals with a synthetic peptide corresponding to residues near the amino terminus of histone H3 in which Lys9 is tri-methylated. This Cell Signaling Technology antibody is conjugated to phycoerythrin (PE) and tested in-house for direct flow cytometry analysis in human cells. This antibody is expected to exhibit the same species cross-reactivity as the unconjugated Tri-Methyl-Histone H3 (Lys9) (D4W1U) Rabbit mAb #55286.